New looks from shopping your closet. You can create a fresh look from your current wardrobe by just adding a belt! I often prefer to surrender the waist, but I’ve been shopping my closet for new looks, and this one I love. 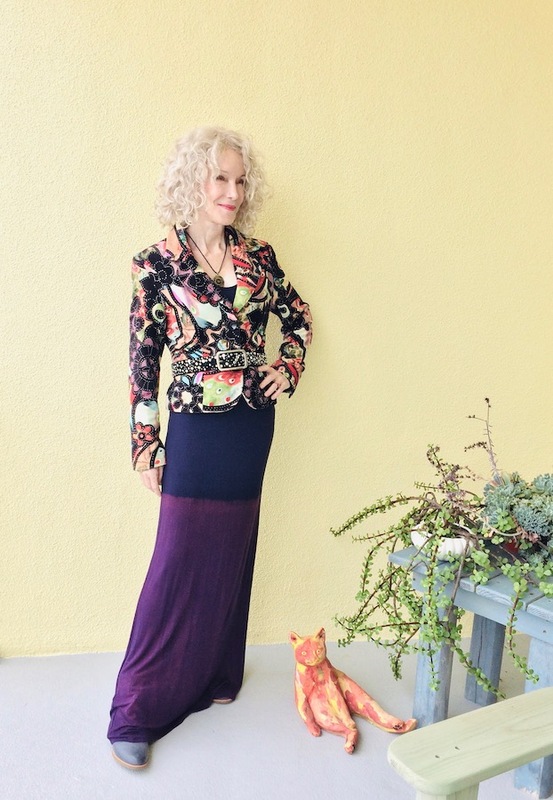 This vintage velvet blazer stands alone as a signature piece; I found it at Suzanne’s Etsy shop last year. It’s the perfect weight to serve as a Florida winter outer-piece. And today it got another look by adding a studded suede belt (thrifted years ago). It creates a fresh silhouette, it’s more intentional and a bit dressier. There isn’t a color in my closet that this blazer doesn’t go with. It’s so groovy. The dress underneath is a tall drink of water, an ombre knit maxi by Go Couture. Made in the USA, it was thrifted locally and I don’t wear it enough; it’s as comfortable as your favorite sleep dress. I’m working on ways to get more wear out of it, and it will likely end up as a comfortable sleep dress . I love an open neckline that invites necklaces, short or long. Today it’s an old silver pendant. I can’t do a completely lady-like look! 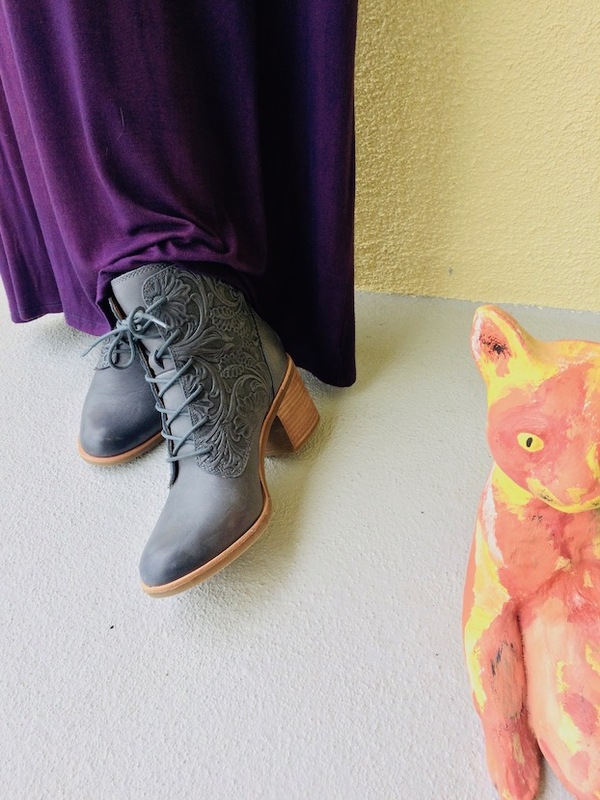 I wore my new tooled-leather Sofft boots to funk it up. The slight heel works well with a long straight dress. Are you exploring your closet for original looks? Show us in the link-up. Have a closet full of clothes but nothing to wear? 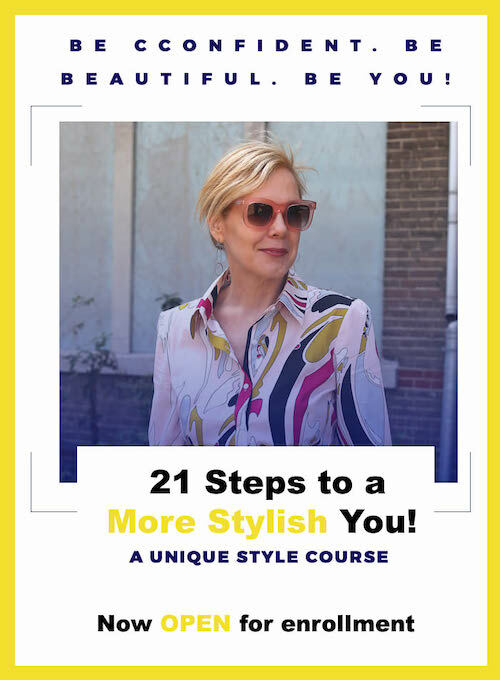 My good friend and super-stylist Sylvia is offering an exciting course: 21 Steps to a More Stylish You. Just click here for all the info, and you will love what you learn. I don’t know what I love more: the jacket or the booties. Soooo cute. Thanks Daenel! Love your throwback-1940’s look, xox. That jacket is gorgeous, Patti! Love it with the belt and those boots are pretty, too! Thanks Debbie! And I like how you styled your tie-dye dress, xox. That is a totally adorable jacket. I want it, haha. Beautiful jacket, I love it with the belt. It creates a lovely, long silhouette with the dress. thank you Emma! Your mustard sweater plus hat are fun and chic, xox. WOW Patti! What a show stopping blazer! And the shoes..what fun! I do agree, when you are looking to mix things up – or are bored with the everyday, they shopping your closet. You never know what you will find! What a beautiful vintage blazer! You look classy! I love that jacket. The colours could be matched with almost anything and those boots are simply stunning! Thanks Alison, and thanks for linking up! I liked your post about why you blog, xox. Patti, those boots!! Im dyin! Love the style with the lace and the combat style.. Sofft s such a great brand. The outfit is beautful too, lvoe the sillouette on you! What a great look! That is of course the brilliant bit about choosing colourful clothing like the blazer, it goes with everything. Gotta say you look like one tall, cool drink of water in this. I’m sure Sandy thought so too. Sandy did like it, thankyouverymuch! You make me want to do a version of this outfit, Patti. 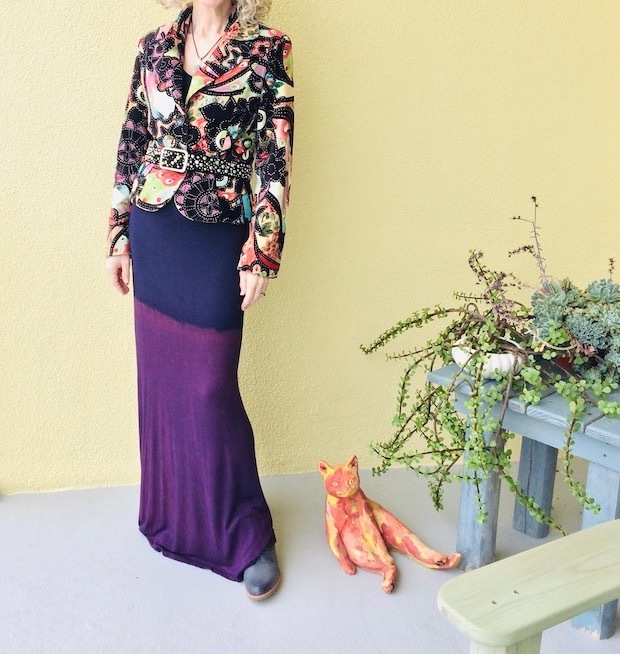 There’s no reason us FL ladies need to put our maxi skirts aside for the winter. You must have a lot of fun shopping your closet, you have such interesting pieces! Wow – you look ready to hit the red carpet in this stunning look! Your blazer is gorgeous and compliments your purple maxi wonderfully. Shopping our closet is such a fun way of playing dress up! Absolutely stunning, Patti! I love a statement coat or jacket and your whole ensemble is witty and brilliant. I’m short waisted so rarely “do” belts, but I may give one a try. Gosh, and what a belt it is!! I have a ton of belts and haven’t been wearing them at all. I need to rethink my outfits!!! Patti, this is all sorts of fabulous! That jacket is to die for, totally groovy indeed! First of all I love that floral blazer so much. And I love it over that long colorblocked maxi skirt. Greatly-styled with a belt! Thanks Ada! I hope your week ahead is full of joy, xox. Ha. This body doesn’t do belts any more. Why I’m still keeping some in my closet is can only be answered by the hoarder gods (no minimalism here). So I surrender to the waist! Pass the potato chips! You and belts, on the other hand, are friends. Both the dress and the blazer are special pieces. I love the belted blazer! Hope to see you on my Fancy Friday linkup party! I am all for shopping your closet , it stretches the imagination so much more than simple buying something new constantly. I love that velvet blazer , it would be perfect with so many different outfits. I hadn’t heard that tall glass of water expression in ages. Many thanks for hosting Visible Monday. Oh, I love that blazer – be still, my heart! Wow! Luxurious looking–that skirt especially. Thanks Becky! Hope your week ahead is wonderful, xox. That velvet jacket is absolutely stunning. I can certainly see how it would go with, and embellish any outfit. The maxi is also quite beautiful and I adore the casual boots with it. You know I am all for fashion dichotomy.! And the answer is yes. As I prepare for New York fashion week I am certainly shopping my closet! Patti – I love your hair! That blazer is magnificent and those booties are not only beautiful but I’m guessing they are every bit as comfortable as the name Sofft implies! That is such a terrific brand, I own one pair of their sandals and I am crazy about them! I’ve been shopping my closet all month (dry January and all!) and it forces me to be more creative and I’ve found a couple of combinations that I wouldn’t have even considered before. You don’t always have to be shopping to look stylish! Thanks for hosting this link-up! Whoa! Loving everything about this outfit. That jacket is spectacular. Looks great belted with that fab maxi. And those boots! I jumped right on the Sofft site, but didn’t find them. The tooled leather is very eyecatching.